Fixed an issue where TOC links in Fast Mode would not work. Added options for Fast vs Resilient link mode and ability to update existing TOC page. I am trying to use this macro to fit my need. I am a project manager for 2 sales representatives. I have my notebook set up where all the sections are a different job. Each section has a Generic About info including sales engineer name and id #. Is it possible for me to use this macro not only create/update TOC, but with a formatted table instead of a list. Portions of that table would come from each section. For example, in 12 sections, i have 12 jobs from 3 engineers with job IDs, is it possible for this macro to gather info from the jobs and create/update the table with the data gathered. Just used this one, today, and it was SO HELPFUL!! I had to switch pc's and had made multiple backups of my notebooks over the last weeks and am totally paranoid that I'm going to loose that one little scrap of a note that didn't get copied, for one reason or another. I used this on 2 seemingly identical notebooks, found the one with the info I needed and discarded the unfinished one! This macro saved me lots of time and effort! Love this feature. Makes it so much easier to navigate a long document. Just wish I could automate the "Headings" feature. Is there anyway to do a find/replace so that a tag or a bit of text is replaced with a Heading? I would love a macro that created a TOC for a section group. I have no idea about coding, so this is far beyond me. very useful, although it does not work for Section Group. If I have subsections in my main section then I can not do TOC for all the subsections. amazou16: That would require macro to read contents of all pages, which will take significantly longer. Macros currently doesn't support anything like auto-updating a page when some other page changes. Contrary to what it seems, it is quite a complicated problem to solve. Is ist possible to have a TOC also for a "section group"? We have a big OneNote book and if we make a toc with the scope "pages" we get an error. Is there a way to refresh an existing TOC for a section should the section contents change? Not having to rerun the macro, as I typically put it as the top entry on each section. I'm a Microsoft MVP in Enterprise Mobility. Is there anyway to modify the Macro please so that the TOC it creates is bulleted and there is a paragraph space between the end of the Subpage list and next higher level subpage? I do have a problem with using this macro though. I keep getting the error "The XML is invalid.". One change I\'d like to make: insert the outline at the current cursor position instead of adding an entirely new page. I want the ToC embedded in the front page, with some introductory text, not at the end. first: Tanks a lot for what you are doing! Second: Im too Stupid to install a macro. I downloaded the newest version of onetastic. I dowonload the macro. I opened with the macroinstaller.exe. 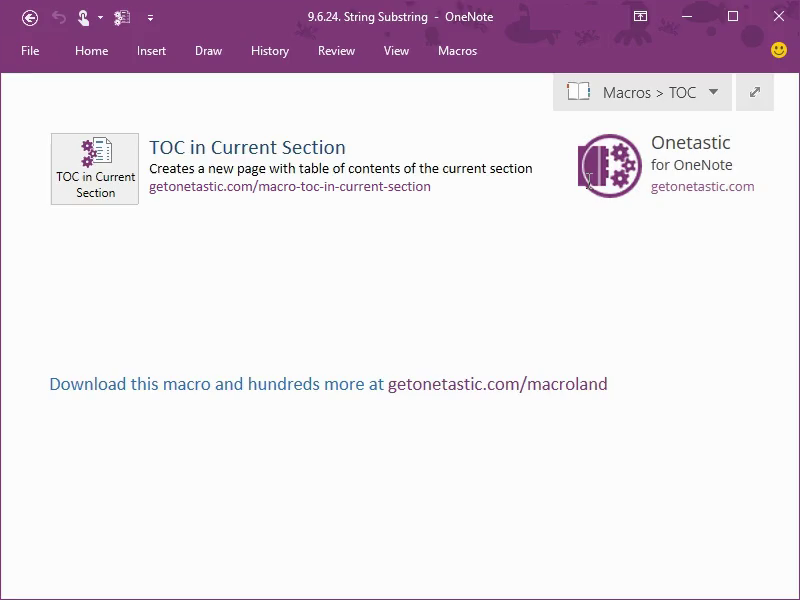 But in onenote i dont see the macro. What did i do wrong.